‘Natural’ has been a major food buzzword over the last few years, and now even your pets can enjoy the benefits of minimally processed natural foods. One prominent example of the natural foods movement is the growth of ‘organic’ produce; in short, foods grown and raised with more traditional farming techniques, designed to reduce the impact that food production has on the environment, and potentially result in more nutritious crops and animal products. It is hard to find a dog food that’s totally organic. Their recipes rely on a very broad range of ingredients to ensure dogs’ nutritional needs are met, so sourcing entirely organic produce is not often possible. However, foods made from natural, minimally-processed ingredients abound, and we’re here to help you find the right fit for your pooch. 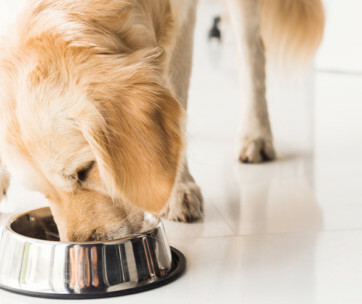 We’ve compiled a list of the top 20 dog foods featuring natural or organic ingredients, so you can make an informed decision when it comes to feeding your pet. We’ve also answered some common questions about organic dog foods in particular, so you know exactly what you’re getting when you choose this option. 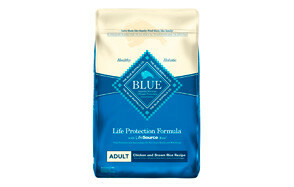 Blue Buffalo is a well-known name when it comes to high quality, natural pet foods. Their Life Protection formula places real meat at the forefront, coupled with wholesome veggies, fruits, and whole grains. This particular recipe features real, farm-raised chicken, offering a healthy and easily digestible protein source that your pooch is sure to love. The blend also contains the complex carbohydrates dogs need for energy, along with omega-3 and 6 fatty acids which promote a shiny coat and healthy skin. Blue Buffalo’s patented ‘Lifesource Bits’ can also be found among the kibble. These tasty bites contain a carefully blended mixture of antioxidants, vitamins, and minerals, designed to support your dog’s immune system. Each vitamin is extracted from a natural source, so you can rest assured your canine companion enjoys the tasty, omnivorous diet that nature intended. The natural recipe is free from meat by-products, soy, corn, wheat, and artificial flavors and preservatives, making it ideal for dogs with sensitive stomachs, too. The next healthy dog food to earn a spot on our list is this blend by Diamond Pet Food. The tasty recipe is based around delicious, pasture raised beef, cooked into a form that’s both nutritious, and easy to digest. The carefully balanced recipe is tailored to include all the amino acids adult dogs need to maintain healthy muscle mass, while added vitamins and minerals support their overall health. As well as premium beef, the recipe features a range of fruits and vegetables that provide the perfect blend of micronutrients. Antioxidants support your pet’s immune system, while a blend of fatty acids helps keep their coat and skin in tip top condition. The food is also tailored to promote digestive health – natural probiotics support good bacteria in the GI tract, helping your dog to maintain regular and comfortable digestion. The recipe is free from corn, wheat, and filler, as well as being made without artificial colors, flavors, or preservatives. For pooches with grain allergies, this dry food by Wellness Core could be the perfect option. Their grain free dog food offers complete and balanced nutrition for dogs. Featuring 80% more meat than conventional dog foods, Wellness Core’s recipe provides dogs with the high level of protein they would have in the wild. Alongside this tasty blend of protein rich but easy to digest turkey and chicken, the blend contains a unique blend of vegetables, healthy oils, and vitamins and minerals. Antioxidants support your dog’s immune system, while omega fatty acids help to keep their skin and coat in excellent condition. The recipe also contains probiotics, to support the good bacteria in your pet’s GI tract, encouraging regular digestion. The recipe is free from the most common dog allergens: wheat, corn, soy, meat by-products, and artificial colors, flavors, or preservatives. Core’s formula, made in the USA, offers dogs complete and natural nutrition. Another excellent grain-free option is this tasty blend produced by Taste of the Wild. This unique recipe features a rather unusual protein source – roasted bison! Dogs will love this rich and delicious meat, which possesses an optimal amino acid profile, leading to lean and strong muscles. Although bison meat is this food’s primary ingredient, the recipe also features a balanced blend of fruits, vegetables, and superfoods, to provide pooches with all the vitamins and minerals they need for a happy and healthy life. These ingredients are a great source of antioxidants, which support healthy immune function, as well as fatty acids to promote healthy skin and hair, and probiotics to help good gut bacteria thrive. The natural recipe is free from corn, wheat, and filler, as well as artificial colors, flavors, or preservatives. Every bag of Taste of the Wild food is made in the USA, with carefully sources, sustainable ingredients. The next top quality dog food to make our list is by Avoderm. Their patented formula is ideal for pooches suffering from minor skin complains, using avocado to naturally promote a healthy hair and skin. The grain-free formula contains natural chicken meat at its core, combined with a blend of fruits and vegetables designed to provide dogs with all the vitamins and minerals they need to maintain excellent overall health. The food provides dogs with nutrients including antioxidants, to support proper immune function, B vitamins, to promote a healthy metabolism and energy levels, and iron, for healthy blood. The recipe’s most distinctive feature, however, is the presence of California-grown avocados, which keeps your dog’s skin and coat in tip top condition. The recipe is also free from corn, sot, meat by-products, and artificial colors or preservatives. This makes it a great option for dogs with mild allergies and intolerances, which helps their skin to recover from any adverse reactions. Newman’s Own offer one of the best organic dry dog foods about. The tasty formula features natural, unprocessed chicken as its main ingredient, closely followed by a number of organically grown whole grains and vegetables. Organic brown rice provides dogs with the fiber they need to maintain a healthy digestive tract, while antibiotic-free chicken offers delicious and highly digestible protein. The recipe is also free from wheat, corn, and artificial colors and flavors. The B vitamins added to this blend support dogs’ energy levels, while antioxidants contribute to a healthy immune system. The recipe’s crunchy kibble also helps dogs to keep their teeth clean. Best of all, 100% of of the profits produced by Newman’s Own foods are donated to charity. Buying this dog food supports great causes such as the Fidelco Guide Dog foundation, Serious Fun Children’s Network, and the Search Dog Foundation. Another strong contender for the best all natural dog food is this tasty recipe by TruDog. With their ‘less is more’ mindset, TruDog have put together a great food with quality ingredients. At the heart of the recipe, is grass-fed Wisconsin beef, sourced from free ranging cows only. Alongside the meat itself, a careful blend of beef organs help to provide your dog with the vitamins and minerals they need, naturally. This organic dog food is produced by freeze-drying each ingredient, ensuring its nutrition is carefully preserved, so you can count on your dog getting everything their body needs with each serving. Unlike other recipes on the market, TruDog’s blend doesn’t contain fruits and vegetables, making it a great option for picky, meat-loving dogs. Herring oil in the formula provides the omega-3 and 6 fatty acids required to keep skin and hair healthy, while naturally occurring antioxidant support healthy immune function. Finally, the recipe is free from wheat, corn, sugar, fillers, and meat by-products. 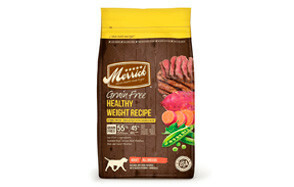 For dogs who could stand to lose a little weight, Merrick’s healthy grain-free recipe could be the perfect choice. It has significantly fewer calories and fat per ounce than conventional dog foods, instead relying on healthy protein and fiber to keep canine hunger pangs at bay. The recipe consists of 55% protein, sourced from beef and chicken, and minimally processed. The remaining 45% of its ingredients are a range of vegetables, packed with the vitamins and minerals pets need for a healthy life. Omega-3 and 6 fatty acid keeps their coat and skin in great condition, while glucosamine supports healthy joints – especially important for larger breeds. The recipe is also rich in naturally occurring antioxidants, to support your pooch’s immune system. It’s also free from grains, and artificial colors and preservatives. Finally, the fiber rich formula promotes healthy digestion and keeps dogs feeling fuller for longer. Nutro’s dry puppy food provides pups with all the nutrients they need, naturally. At its core is tasty and digestible farm-raised chicken, providing all the protein that growing pups need. All of its ingredients are non-GMO, and the recipe is free from meat by-products, corn, wheat, soy, and artificial flavors, colors, and preservatives. Alongside its healthy protein base, the food also contains a range of sustainably grown vegetables and whole grains, including sweet potato and brown rice. The nutrient rich formula contains omega-3 fatty acids to help promote your puppy’s growth and development, as well as supporting their hair and skin. It also features plenty of calcium, for strong and healthy bone growth. This calcium also supports healthy joints. This food is suitable for small breed adult dogs as well as puppies. The second natural puppy food to make our list is this tasty blend by Fromm Family Foods. Their tasty formula relies on all-natural chicken, meat, as well as real cheese for extra calcium and a great flavor. The recipe is formulated specially for puppies, to ensure they have all the energy they need to grow up strong and healthy. Alongside its chicken base, a mixture of wholesome vegetables, including carrots, celery, and sweet potato, provide the fiber and vitamins puppies need. It has a higher fat content than adult dog foods – 18% minimum, to give puppies the rich diet they need for the rapid growth they undergo. Added salmon oil helps to moisten the food, while also providing the fatty acids needed for healthy overall development, as well as a shiny coat and flake-free skin. 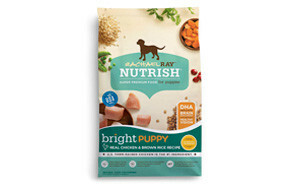 The next natural puppy food to earn a spot on our list is this recipe by Rachael Ray Nutrish. Its number one ingredient is farm-raised chicken, sourced from the US, providing a source of healthy, tasty, and easy to digest protein for tiny mouths. The recipe also contains a source of DHA (a type of fatty acid), promoting brain development and healthy vision. As well as this, the formula is rich in antioxidants, thanks to a carefully selected blend of fruits. These vitamins support the development of your pup’s immune system, which will be essential in later life. The brown rice, carrots, and peas in the food contain a whole host of B vitamins, which help to maintain a healthy metabolism and energy levels. It’s also free from meat by-products, and artificial colors, flavors, and preservatives. Earning their second spot on our list, Newman’s Own have developed this delicious wet food for dogs with organically raised chicken. In fact, 70% of its ingredients are organic, giving your dog the quality, natural food they deserve. The recipe features unprocessed, organic chicken as its number one ingredient, providing pooches with the delicious meaty protein they crave. Meanwhile, the organic brown rice in the recipe is great for slow release energy, and also provides the fiber required for a healthy digestive system. A selection of vegetables in the food combine with these ingredients to provide the vitamins and minerals dogs need to maintain their overall health: B vitamins support the metabolism, while omega-3 and 6 fatty acids keep the hair and skin in excellent condition. This blend is free from artificial colors, flavors, and preservatives, too. The next food to earn itself a spot on our list is Halo Holistic’s offering. It’s designed specially for smaller pooches, providing them with the extra calories their fast metabolisms require, in smaller kibbles to better suit their mouths. The food is made with real, whole chicken, unlike many other brands which instead use meat meals. This protein rich yet light meat offers good digestibility, leading to a regular digestive system. Alongside this whole meat, the recipe contains nourishing whole grains and non-GMO fruits and vegetables. The blend provides your small dog with complete and balanced nutrition, including omega-3 and 6 fatty acids, vitamin A, and B vitamins. Halo Holistic never use animals raised with antibiotics, or factory farmed produce in any of their products. It’s also free from artificial colors, flavors, and preservatives. Health Extension have also found a place on our list with their carefully blended grain-free dog food. Prepared with delicious whole ingredients, the recipe is packed with all the nutrients dogs need for a happy and healthy life. Its main ingredient is organic, free range chicken, providing a cruelty-free source of protein for your pooch. Alongside the high quality meat, the recipe features whole vegetables and berries, which provide a healthy blend of vitamins, minerals, and fiber. Calcium in the recipe promotes healthy bones and teeth, while omega-3 and 6 fatty acids for healthy skin and hair. This food also contains natural prebiotics to support the good bacteria in your dog’s digestive tract. The recipe is totally free from grains, gluten and soy, as well as artificial flavors or preservatives. The next natural dog food to earn a spot on our list is this tasty recipe by Holistic Select. The formula is crafted specially to promote digestive health: it contains prebiotic fiber, natural probiotics, digestive enzymes and botanicals. These powerful ingredients combine to ensure your dog enjoys great digestive health. Its larger kibbles and fiber rich formula are ideal for larger breeds, while real chicken forms the basis of the recipe. The chicken is combined with a selection of wholesome grains, fruits, and vegetables, providing a complete blend of essential vitamins and minerals. Vitamin C helps support your dog’s immune system, and B vitamins promote healthy energy levels. The recipe also contains glucosamine to support healthy joints, since heavier dogs put more pressure on joints by nature. Inspired by fertile lands of Kentucky, Acana’s Meadowlands dog food contains 70% free-range poultry, eggs, and fish. It’s designed to mirror your dog’s evolutionary diet, providing the protein they need for a happy healthy life. 50% of these meat ingredients are fresh and raw, preserving the nutrients within. The meat itself is always USA sourced, from farms which use free range rearing methods. The remaining 30% of Acana’s recipe features vegetables, fruits, and botanicals, naturally supplying the vitamins and minerals they need for complete health. Among these minerals is zinc, required for proper cell division and immune system support. Making their second entry onto our list is Halo Holistic, with their surprisingly protein-packed vegan dog food. Evidence suggests that dogs are omnivores; many can, and do, thrive on a vegan diet, provided the food they consume is considered carefully. For instance, dogs with allergies to certain animal proteins could benefit from replacing meat with plant proteins. Halo Holistic derive their vegan protein from chickpeas and legumes. Flaxseed delivers the same omega-3 and 6 fatty acids as fish oil, keeping your dog’s coat and skin healthy, while B vitamin supplements support their metabolism and keep energy levels high. The recipe is free from meat, dairy, corn, and wheat. All of its ingredients are non-GMO, and sustainably sourced. The next natural dog food to earn a spot on our list is this tasty dry food by Eagle Pack. The recipe contains delicious lamb meal as its main ingredient, providing dogs with the protein packed diet they need for overall health. Made without corn, soy, or meat by-products, the formula is ideal for pets with sensitive stomachs or grain allergies. It’s also free from artificial colors, flavors, and preservatives, so you can rest assured only natural ingredients are allowed in. Along with the protein-rich lamb meal, the food contains a unique blend of wholesome grains and vegetables, providing your dog with fiber, antioxidants, and omega-3 and 6 fatty acids. Combined, these nutrients support your dog’s overall health, from their immune system to their coats. 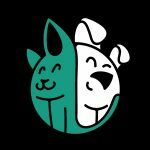 The Honest Kitchen believe that man’s best friend should eat just as well as their owners, and they’ve proven this with their human grade dehydrated puppy food. At its heart, the recipe features delicious ranch-raised beef. The protein rich formula gives dogs the nutrition they need for healthy muscle mass and overall well-being. The grain-free blend features higher levels of calories and fat than adult dog foods, giving pups all the energy they need for their intensive growth spurts. A mixture of dehydrated sweet potato and kale, along with a few other supplements, provide all the vitamins and minerals growing pups need. Calcium in the food supports teeth and bone development, while omega-3 and 6 fatty oils help both brain development and healthy skin and hair. All the ingredients are non-GMO, and carefully sourced. To serve, simply rehydrate the mix with hot water. Another contender for the best organic dog food is this tasty Castor & Pollux recipe. The patented blend is based around organic free-range chicken, a delicious and easily digestible source of protein for mature pooches. Along with this poultry base, added glucosamine supports healthy joints. The recipe is also packed with superfoods, giving your pooch the unique blend of vitamins and minerals they need for overall health and happiness. Each ingredient is sourced from producers who don’t use chemical pesticides, synthetic fertilizers, growth hormones, or antibiotics. The recipe is also free from artificial preservatives. These 20 products are our top picks when it comes to natural and organic dog food. The wide variety on offer is great for dog lovers, but having so many choices at your fingertips can also prove a little overwhelming. That’s why we’ve put together this handy buying guide, helping you to work out which option is right for your dog. We’ve also answered some common questions about what counts as organic food, and the advantages it has over other its conventionally farmed counterparts. In a natural dog food, unless you’re purchasing a vegan option, a recognizable meat, or ‘meat meal’ should be the first ingredient listed. This demonstrates that the food is properly tailored to the relatively high protein requirements of domestic dogs, and will properly sustain their muscle mass. Unless your dog suffers from a grain allergy or intolerance, seeing whole grains (such as brown rice) in a dog food is a good sign. These unprocessed grains provide slow-release carbohydrates, along with a whole lot of fiber. This keeps dogs regular in the digestive department, and is a much healthier choice for good gut bacteria than a refined grain. In most natural dog foods, fruits and vegetables will be included to provide dogs with the blend of vitamins and minerals they need for general health. In a high quality option, you’ll see recognisable, whole vegetables listed on the ingredients label. This tough-to-pronounce additive is a synthetic preservative found in many pet foods. Long-term exposure to ethoxyquin has been linked to kidney damage, liver damage, immune deficiency, and even cancer. If a dog food label lists a meat ‘by-product’, it’s best avoided. Meat by-products do not contain actual muscle, and sometimes contains diseased tissues, or even tumors. This particular ingredient is also found in antifreeze. It reduces the moisture content of dog food, and also prevents bacterial growth. Just like humans, dogs have a delicately balanced colony of bacteria in their GI tracts, and ingredients with such powerful anti-bacterial properties can prevent them from performing their digestive function. It also reduces the moisture found in food as it passes through your dog’s system, which can lead to blockages and even cancer. Butylated-hydroxyanisole (BHA) and Butylated-hydroxytoluene (BHT), are two more artificial preservatives that pose a danger to your dog if ingested. It can trigger liver damage in dogs, and is directly linked with the development of cancer in both canines and humans. Used to sweeten things up in dog food and human food alike, corn syrup is not a healthy choice. When dogs ingest too much sugar, they increase their risk of weight gain, diabetes, and even behavioral changes such as hyperactivity. Dry foods tend to offer the best nutritional value - and value for money - pound for pound. They’re easy to store, long-lasting, and available in a wide variety of flavors. The main disadvantage of dry foods is that their nutrition is very concentrated. This might seem like an advantage, but it makes overfeeding your pet, leading to weight gain and its attendant problems, much easier. 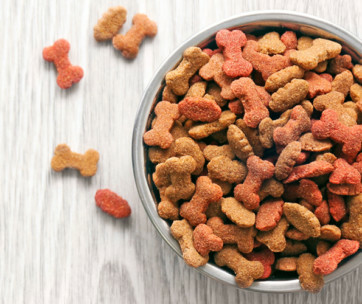 Some pooches also find dry food less appealing, and it’s a good idea to moisten it with some water (or gravy as an occasional treat) before feeding. Canned dog food is usually the most expensive way to feed a dog, but it does have some advantages. 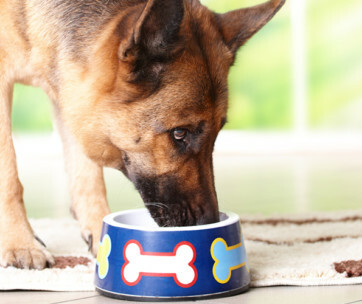 The food is less calorie-rich than its dry counterparts, so dogs can eat more by volume without weight worries. It also helps maintain proper hydration, thanks to its increased water content. Some dogs simply prefer the texture to dry or raw food, while for dogs with dental problems the soft pieces are easier to eat. Raw dog foods have a similar appearance to their dried counterparts. The difference is that the ingredients in a raw food are typically freeze-dried rather than cooked. This makes for a softer texture than your average kibble, and tends to preserve more of the food’s nutritional value. This is because cooking alters the shape of an ingredients molecules, in a process called denaturing. This changes its nutritional content slightly, and can cause nutrients to leak away. Raw foods are often the most nutrient-rich, but can also be the most expensive. If you’re feeling creative, you can also make your own organic dog food at home, by combining organic meat, whole grains, and vegetables. Simply cook the meat in a skillet, before adding it to a large pot alongside brown rice and water, simmering for 15 minutes. Next, add a selection of vegetables (we recommend carrots and broccoli) for 5 to 10 minutes, allow to cool, and serve. Just remember that the best organic dog food brands offer complete nutrition for your pooch, and this can be hard to recreate in a domestic kitchen. If you do decide to make your own organic dog food, we recommend supplementing it with a good quality purchased option. Q: What does organic dog food mean? A: Organic foods are produced without the use of pesticides, synthetic fertilizers, genetically modified organisms, ionizing radiation, growth hormones, or antibiotics. In short, they’re grown using natural alternatives to industrial farming methods. It takes three years for land to be converted to organic status, to ensure there are no residual synthetic chemicals in food that is labelled ‘organic’. Q: Why is organic dog food better? A: Although there is no definitive evidence that organic foods are nutritionally better than their non-organic counterparts, research from the university of California found that organic tomatoes contain higher levels of vitamin C than their non-organic counterparts. Currently, the thought is that, without chemical pesticides, plants are forced to produce a higher volume of phytochemicals. These chemicals protect the plant from pests and disease, and are thought to have health benefits ranging from reducing the risk of cancer to improving the immune system. Organic farming methods are also better for the environment, because they do not release pesticides and fertilizers that can have negative effects on the ecosystem. Q: What is the percentage of organic ingredients needed to be labeled as organic? A: The USDA’s Organic seal guarantees that the ingredients in the food you’re holding were produced organically. Q: Are all organic ingredients also non-GMO? A: Yes. To be considered organic, farmers cannot use genetically modified organisms. This matches the overarching philosophy of the organic movement; returning to more traditional, less intensive farming methods, with less human manipulation. When it comes to natural dog foods, our favorite has to be Blue Buffalo’s. Their affordable but high quality recipe always puts real meat first, providing your pooch with the protein they need to live a healthy life. Alongside this meat, whole grains, vegetables, and fruits, provide the vitamins and minerals dogs need. The recipe also features unique Lifesource Bits; tasty kibbles containing antioxidants and vitamins designed specifically to cater to your dog’s needs. These antioxidants support the immune system, while omega-3 and 6 fatty acids promote healthy skin and hair. It’s also free from a host of potential allergens - soy, corn, meat by-products, artificial flavors and preservatives.